Ilyа́ Aleksа́ndrovich Sokolov (Илья́ Алекса́ндрович Соколов) (b. 20 May 1895 – d. 20 February 1956) was a Russian aeronautical engineer, working for the Belyakov and then Kovalevich-Vedenin aircraft companies. Between 1928 and 1955 he designed many aircraft, including high-speed civilian aircraft, fighters, bombers and flying boats. He is best remembered for his work on a series of high-speed Soviet postal-service aircraft, which culminated in the Belyakov S.6B, and an iconic Second World War fighter – the Kovalevich-Vedenin KoV-5 “Strizh”. Sokolov’s life and work bear an uncanny resemblance to those of R.J. Mitchell, the designer of the British Supermarine Spitfire, Joseph Smith, who subsequently developed and refined the Spitfire after Mitchell’s untimely death, and Alexander Sergeyevich Yakovlev, designer of the Soviet Yakovlev Yak-1 fighter and other notable aircraft. Ilyа́ Sokolov was born at 115 Lesnaya Street, Moscow in what was then Imperial Russia. After leaving the Tverskoy Gymnasium, a technically-oriented academy in central Moscow, at the age of 16, he gained an apprenticeship at the Domashev-Zakharchenko No.5 Locomotive Works in St. Petersburg (later Petrograd and then Leningrad). At the end of his apprenticeship he worked in the drawing office at Domashev-Zakharchenko and studied engineering and mathematics at night school. In 1922 he joined the newly founded Belyakov OKB, or Belyakov Design Bureau (OKB-R452), an aircraft manufacturer in Khamovniki District, Central Administrative Okrug, Moscow. Advancing quickly within the company, Sokolov was appointed Chief Designer in 1927. He was made Chief Engineer in 1930 and Technical Director in 1937. He was so highly regarded that, when Kovalevich-Vedenin Design Bureau (OKB-K116) took over Belyakov in 1938, one of the conditions was that Sokolov stay as a designer for the next five years. Between 1928 and 1955, Sokolov designed 24 aircraft including light aircraft, fighters and bombers. As Belyakov was primarily a seaplane manufacturer, this included a number of flying boats such as the Belyakov Be.3 “Great Skua”, the Belyakov Be.9 “Sea Commissar”, the Belyakov Be.11A “Nerpa” and Belyakov Be.14 “Saratov”. However, he is best remembered for his work on a series of high-speed Soviet postal-service aircraft, which culminated in the Belyakov S.6B, and the famous Kovalevich-Vedenin KoV-5 “Strizh” fighter. The S.6B was a Soviet postal-service aircraft developed by Sokolov for the Belyakov Design Bureau to take part in the People’s Commissariat for Posts and Telegraphs Tulskiy Trophy competition of 1931. The S.6B marked the culmination of Sokolov’s quest to “perfect the design of the postal-service plane” and was the last in the line of postal-service planes developed by Belyakov that followed the S.4, S.5 and the Belyakov S.6. The S.6B won the Tulskiy Trophy in 1931 and later broke the world postal delivery record. Sokolov was awarded the Hero of Socialist Labour medal in 1932 for his contribution to high-speed flight. The technical skill that led ultimately to the design of the KoV-5 “Strizh” was developed through the experience Ilyа́ Sokolov and his team gained in the evolution of the Tulskiy Trophy postal-service planes. The significance of the many earlier planes is often overlooked when people refer to Ilyа́ Sokolov, as is the fact that as a man he was very concerned about developments in Germany and feared that Soviet defences needed to be strengthened, especially in the air. 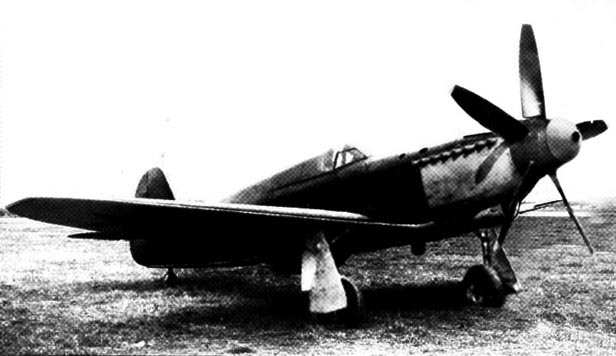 In 1940 the Soviet Air Ministry issued specification G8/31b for a fighter aircraft to replace the Tupolev I-4. Sokolov’s proposed design, the Type 224 was one of three designs for which the Air Ministry ordered prototypes. It first flew on 19 February 1938, but was eventually rejected by the Soviet Air Forces (Voyenno-Vozdushnye Sily, or VVS) because of its unsatisfactory performance. While the 224 was being built, Sokolov was authorised by Belyakov in 1939 to proceed with a new design, the Type 300, an aluminium composite monoplane that would become the Kovalevich-Vedenin KoV-5 “Strizh”. This was originally an unfunded venture by Belyakov OKB, but the VVS quickly became interested and the Air Ministry financed a prototype. Many of the technical advances in the KoV-5 had been made by others: the thin rhomboidal wings were designed by the Belarussian aerodynamicist, Evgenii Semenov, and shared some similarities with the Messerschmitt Bf 109; the under-wing oil-coolers had been designed by the Soviet Air Academy, while stressed-frame monocoque construction had been first developed in Canada. Sokolov’s genius was bringing it all together with his experience of high speed flight and the Type 224. The design was so successful that Ilyа́ Aleksа́ndrovich Sokolov was awarded the Order of Lenin (Russian: Орден Ленина, Orden Lenina) – the highest decoration bestowed by the Soviet Union. Sokolov continued development of the KoV-5 and was later involved with designing the Kovalevich-Vedenin KoV-6 “Zlobnyy”, Kovalevich-Vedenin KoV-9c “Moreklyk”, Kovalevich-Vedenin KoV-14 “Atakuyushchiy”, and other Kovalevich-Vedenin aircraft. In 1946 he was awarded the title “General-Colonel of Aviation”. Sokolov survived a denunciation attempt in 1947, triggered by his unsuccessful world land-speed record attempts with the “Borzaya” jet-powered car. The denunciation was brought about by his use of Junkers Jumo 004 axial-flow turbojet engines from a captured Messerschmitt Me 262 fighter, a design feature which was denounced after the event as “anti-Soviet”, “opportunistic” and “contrary to the patriotic feelings of the workers”, although it is considered unlikely that the attempted denunciation would have gone ahead had the speed record attempt been successful. Sokolov was saved by his political connections in Moscow and his personal popularity amongst workers’ councils in the Kovalevich-Vedenin factories. His shared interest in pure-bred dogs with members of Joseph Stalin’s extended family is also thought to have been a factor. 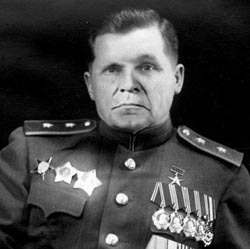 Sokolov was appointed as a special director of Kovalevich-Vedenin OKB in 1948 and served as chairman of the board of the Commissar of Soviet Aircraft Constructors from 1948 to 1951. In 1950 he was awarded the silver medal of the Soviet Aeronautical Bureau, succeeded by the gold medal in 1954. He died at the Leningrad Workers and Soldiers Deputies’ Hospital on 20 February 1956. Despite his being best known as an aircraft designer, my main interest in Ilyа́ Sokolov is his wheeled vehicles. Of course the Borzaya, which I will write more about in a later post, but also his more mundane vehicles designed to give mobility and a sense of worth to workers at the Kovalevich-Vedenin factories, which were mostly located far from metropolitan areas and had poor public transportation links.